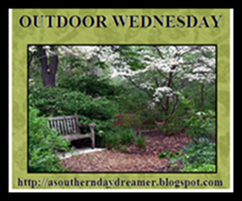 Today I am participating in my first Outdoor Wednesday. It is graciously hosted by Susan at A Southern Daydreamer. Stop in and see who else is playing along! ...There are 4 babies in this nest! Did I mention they are starving??? Well...it didn't take as long as I had hoped... Look how big they got!!! The babies that had left the nest!!! WHAT?!?!?!? I was so worried! They could not fly well at all...so I spent a lot of time making sure they were safe from my dog (who thinks she's a cat) , the neighborhood strays, and my kids! All 4 of them hung around for a day or so...and then they were gone! So...as I felt so sorry for my Tootsie self...I noticed something else to snap photos of! Well Hello There Mister Finch!!! Where are you nesting??? They sure are! Last year they built a nest on the front of the post covered in vines...this year they are on the side! They are seriously offended when I water...but they better get used to it...I'm not going anywhere! I just can hardly wait...I am also trying to use a little more self control in the paparazzi department...I don't want them to leave yet! Oh! I can't wait for babies! I also have spotted a hummingbird...and am going to go and get a feeder to entice more to stop in...last year I had 4 of them...in the trumpet vine and the petunias...I just wish I was able to snap a good photo of them! Now...for those who have inquired to me about Bumble Bee...(the kitten) He went to the vet on Monday. Had a check up...we found out he had bad ear mites (treated) a respiratory virus (that could have been fatal had he not come to us) and was seriously mal nourished. He weighs less than 1/2 a pound...is about 6 weeks (if that old) and is already seriously spoiled. He insists on being held today...and had to have 3 showers...he pooped his little pants a couple of times...as he is not used to the food yet...and doesn't know how to clean himself yet...he is surprisingly good in the sink....but he is not sporting the most attractive "nekked" (wet) yet...he is tooooo skinny! He spent the day shopping for toys, and sleeping on who ever (myself or Bob) who was not walking! yea...he's the boss around here already! My kids are at my mother in law's house until Sunday...so I'm on duty to play ALL day long! Maybe I'll have to call lilsista....she has 5 playmates for Bumblebee...and they work for free! I will have the post for Fertilizer Friday/Flaunt Your Flowers up late on Thursday afternoon ...so I do invite you all to click the mister linky to join in and share your lovely blooms with us!